I stumbled upon Yvonnism’s work serendipitiously through Instagram, if you’d believe it. I saw a photo of the book on her Instagram, which led me to search for her tumblr, which turned out to be a treasure trove of her autobio comics (my favourite genre!). She’ll be collecting her comics into a single book titled Yvonne’s Visual Diaries Vol 1, and though I only have an Instagram picture and an assortment of tumblr posts to go on, it already has a reserved spot in my shopping bag. YonGumix is comprised of Malaysian comic veterans Aimo, Eisu, Hanie, and Zid, and this year they’re putting out a brand new YonGumix book! While the cover and price of the book are not available at the time of this writing While the cover has just surfaced (Props to Eisu for alerting me), there are already some previews floating around and from the looks of it, it’s going to be a full-colour volume! A pretty good deal at RM15! On top of that, Zid’s interactive comic Raksa will finally be available in hardcopy format and Hanie will be putting out an Illustration compilation, so grab them while they’re hot! END is a collective formed by Edward Gan, Daryl Toh, and Jason Chan. Daryl will be bringing Outer God, a Lovecraftian horror comic written by Luc Labelle and drawn by him! It was previously only available for purchase online, and will now be retailing at their booth at RM50. This will go nicely alongside his 31-piece print collection, Fox Mask Man: Memories with the Yokai. Jason also made a Team Fortress 2 fanbook called Red Blue INK, priced at RM20! You can see more preview images on their official promo post. Mousou Garden is a doujinshi group founded by my 3 friends, Bebe, Reinselft, and Ryo, and they specialize in fanworks and doujinshi! This year they’re putting out a Gekkan Shoujo Nozaki-kun Fanbook (RM8) and a Chrom-centric Fire Emblem Awakening Fanbook (RM8). They also have Splatoon keychains and prints for sale too, so check out their promo posts here and here for details! Hwei has cooked up a brand new crossover book of Monster Hunter X Touken Ranbu called…Touken Nyanta?! (For those amongst you unfamiliar with netspeak or Japanese in general, nyan is basically a cutesy onomatopoeia for a cat’s meow) Cat, Monster, and Sword-lovers can finally unite under the same umbrella! …I think. She will also be reprinting her comic Reunion and some prints, so drop by her booth to grab some comic goodness…or talk about cats. Night Safari is made up of Serah, Kuzu, and Rain this year. Serah has already posted her promo post and price list of the stuff she’ll be selling at her booth, which makes her one of the rare breed of booth owners that do their promotional posts to completion at least a week before the event. Made up of Raethes, Sylen, and Hikca, Asgard Aliens is one of the few long surviving doujinshi groups that still actively put out original comic compilations. I thoroughly enjoyed their book A Box of Chocolates, which I bought at Comic Fiesta last year. I’m not sure if they still have copies of the book available, but from their promotional posts they still have Sky, their latest comic offering which I love and already bought during Comic Arts Festival Kuala Lumpur (CAFKL) earlier this year. While their strength lies with originals, they have also branched out into fandom with San, a Samonji brothers-centric Touken Ranbu fanbook by Realm. Do give their comics a try! If you’ve seen Reimena’s work before, then you probably already know about her original webcomic series The World In Deeper Inspection (If you don’t now is the perfect time to start reading it!). She’ll be putting out a new full colour chaplette compilation, which I’m told will be going for about RM20 thereabouts. She’s also making a physical book for her comic about Loneliness which she made and posted in its entirety online earlier this year, which is great because I love collecting physical copies of comics. Her booth promo post is right here if you’d like to know what else she has to offer! Benjamin Chee of Charsiew Space fame will be boothing with his friends Zu and Ziqun this year, and he has a brand new book to boot – Lychee Queen! This cool, refreshing treat will be sold at RM10 each and though the book doesn’t exactly have a synopsis yet, I’m almost sure that Lychee Queen will not disappoint if Charsiew Space is anything to go by! Ziqun will also be selling his book, Wizard Garden, a story about little magicians battling to protect their treasured orange juice in a style reminiscent of syndicated comic strips. Sha-Pen is made up of artsy duo Ili and Maru, the masterminds behind the webcomic Gods Among Men. While they have T-Shirts and other stuff at their booth, what caught my attention was Maru’s new book, U Tried. U Tried is ‘a comic about progress, trying and self-worth‘, and looks pretty interesting to me. Going for RM10 a pop, you can try looking for it at the Sha-Pen booth (and hopefully score this comic as your reward)! Glassine Books is a comics collective spearheaded by Veleries with the aim of spreading creators’ comics far and wide by bringing their books to conventions around the region where Glassine Books is boothing. They currently stock Veleries’s own comic series Traceless Knight, as well as Benjamin’s Charsiew Space and Stephani‘s books. with the current giveaway she’s running on Twitter! Veleries will be launching the first volume of Traceless Knight at Comic Fiesta this year, which you can purchase alone for RM28 or bundle it with a beautiful tote bag for RM55. You can find there full inventory here! Now that I’m done with the main bulk of comics…here’s a selection of booths with artbooks, prints, badges, and other merchandise that have piqued my interest, in no particular order! The notorious KidChan will be bringing a whole roster of fanbooks and illustration books which she has previously only sold at overseas conventions! If you’re a fan of Jojo’s Bizzare Adventure, Touken Ranbu, the Kingsman movie franchise, or just like to oogle at pretty boys in general, you should probably look at the stuff she has on sale and prepare your wallet. I’ve been following Meyoco’s art for a while now on tumblr, thanks to the Water Gems artbook she put out earlier this year (Newsflash, I’m a huge Steven Universe fan). As such, you can imagine my delight when I found out that she will be opening a booth at Comic Fiesta this time around, and that she will be bringing stock for all of her books, including Water Gems! She has put up a tentative price list on her Instagram, so your can peruse that for now to plan your budget! I was intrigued by Potetto’s cutesy artwork after a friend threw her link at me, and it helps that she’s making Steven Universe and Gravity Falls badges! There isn’t a comprehensive merchandise list for her booth yet, but you can check out her Facebook page in the meantime! If you’re a huge fan of cutesy animal illustrations and postcards, Artsyberry’s work will make you take a Corgi to the knee. 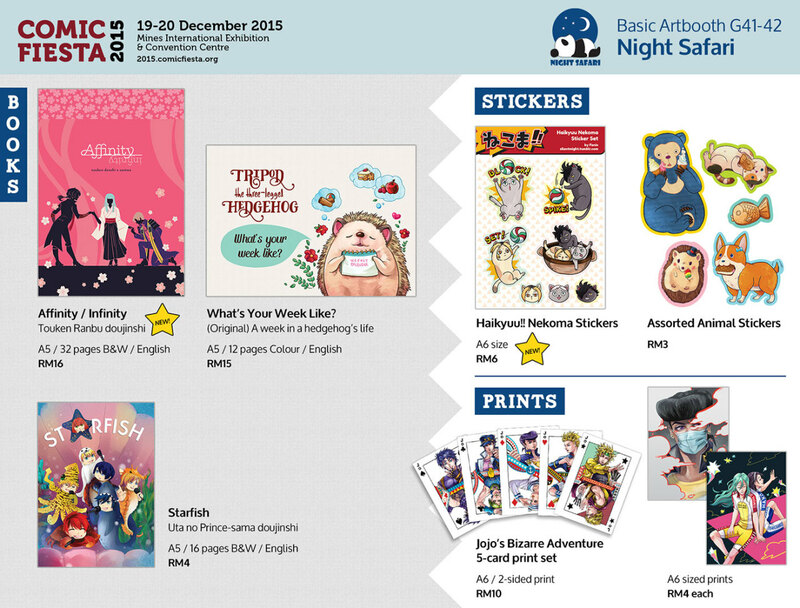 You can find the selection of postcards she’ll be selling at Comic Fiesta on her Facebook page at the moment, which may be updated with other merchandise she’ll be selling in the days leading up to Comic Fiesta. I also found out about Leritoz from a link that was thrown at me, and after trawling through their Facebook page and tumblr, I couldn’t find any information on where they’re located in the hall. Leritoz will be putting out an illustration book paired with quotes, so hopefully those of you who are eagle-eyed will be able to spot this book while circling the halls! I found The Mystery Trunk through my tumblr trawling, and it turned out to be a friend’s colleague’s tumblr. What piqued my interest was their Gravity Falls X Persona Tarot Cards, which I am most likely going to get for myself! As you should be able to tell from their name, their booth is going to be selling Gravity Falls-centric merchandise, so if you’re big Gravity Falls nerd like yours truly, you should check them out! I guess that’s all from me for now! I’ll update this post should I stumble onto more promotional posts of books and merchandise I like, which usually hits fever pitch right about a day or two before the event. In case you’re wondering, yes, I will have a booth (the location which I have already given at the top of this post)…but I find it a little iffy to talk about my own booth when trying to compile a list of things I am looking forward to buying at Comic Fiesta! Still, I figured that I should mention that you can find me, Sapphire, and Joelyn Alexandra at the TEAMworks booth (Basic Booth G40), where we’ll be waiting for you with a Steven Universe fanbook, a writing anthology, and Splatoon prints, amongst other things! Do drop by to say hi, I’d love to talk about comics (especially autobio comics)! Last pieces of advice for those of you heading to the Artist Alley at Comic Fiesta this weekend: Stay hydrated, stay cool, and please bring small change if you want the booth owners to love you forever!